I was saying I wanted to get involved in racing again now that I’m out of school; I didn’t mean to jump in with both feet. But the team needed an experienced woman racer who has time to coordinate the women’s program, especially with some promising cat 4s this year but less depth to the program than in some years. I’m not the best, but I’ve been doing this for a while, and I like mentoring new riders. Riding with the guys is fun, but it will be a treat to have some women’s rides and hopefully help the new racers jump into it. Whew. 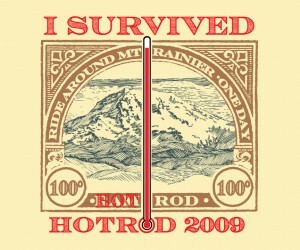 Michael and I completed RAMROD (Ride Around Mt. Rainier in One Day) on the tandem, despite record heat. For those not familiar with the ride, it is a 154-mile, one day event which completely circles a 14,000 foot volcano in Washington state. Usually it is lovely. One legendary year it snowed on the mountain during the ride (in July!) This year it started at a comfortable 78 degrees F before dawn at the base of the mountain, and hit 100 degrees before 11am. There is a long, long exposed climb up a south-facing slope midday, but breezes across the pass when you finally make it to the top. Unfortunately, the denouement after the final pass was a descent into a blast furnace; it was well over 100F at the finish line in the afternoon. Our ride this year was a complete success, if by “success” you mean “finished the ride,” “avoided heat-related illness,” and “were still speaking with each other.” The organizers provided fantastic support – handing out ice-filled tube socks at the base of the longest, hottest climb was a stroke of genius.